York's a pretty flat place - it's said that from the top of the Minster in fine weather, you can see at least eight hen parties - but it does manage to have among its modest slopes a Gravity Hill (right). In other words, an optical illusion that fools the eye into thinking a downhill is uphill and vice-versa. I blogged about Britain's most famous example, 'Electric Brae' in Ayrshire, last year. York's own magnetic scarp is on Water End, part of the newly-signed 'orbital cycle route' that circumscribes the city. It's at about 9 o'clock on the orbital, at the junction with Boroughbridge Road in Acomb. 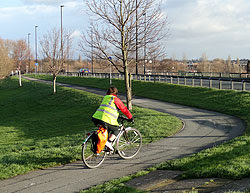 The cyclist in the picture looks like she's going uphill, but in fact she can freewheel: looking away fron the camera the cycle track goes downhill, all the way to the where it joins the road at the top left. Not that any of York's gradients mattered in yesterday's ferociously high winds. Whatever the local topography, you ended up going north-east, with the gale. Thanks for the post. Have you got a Google Map link to where this is? I'd like to visit. Clicking on the photo in the blog post will take you to the Flickr page - or, with any luck, the link in this very comment.